The 2019 racing schedule is posted! Print it out! Stick it on your fridge! Re-arrange any conflicting weddings, reunions, or birthdays! Our 2019 district governor is Oscar Barney. Our fleet measurer is Mike Rees. Contact your measurer to get some measuring done. Here is the Fleet Champion scoring formula. Join the pdxthistles Yahoo! group for the latest news and discussion. About Thistle Fleet 125 The Thistle is a 17′ dinghy designed by Sandy Douglass. We race with 2 or 3 people and cruise with as many as 5. It is probably the highest performance boat for all wind conditions, and is one of the most active fleets at Willamette Sailing Club. 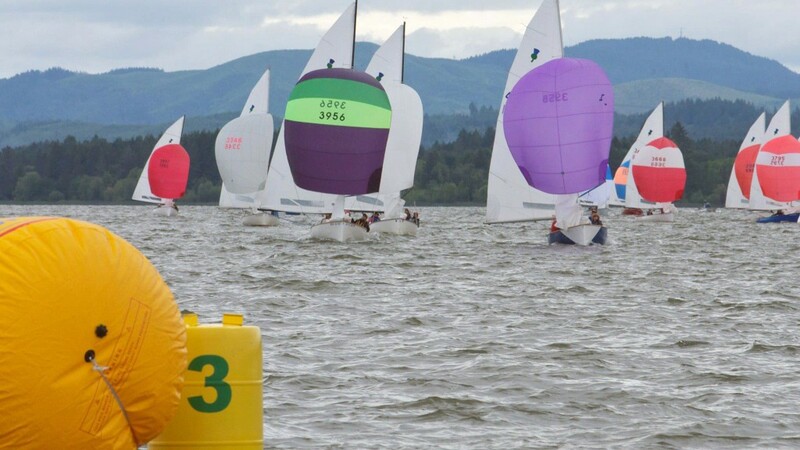 The Thistle is also one of the most active classes in the Northwest with an average of 5 regattas throughout Oregon and Washington during the summer. The national Thistle Class Association is very active. Thistle fleet #125 sails out of Willamette Sailing Club in Portland, Oregon. It is not necessary to be a member of WSC in order to join the Thistle fleet, however most fleet members are WSC members. There are approximately 15 active boats in the fleet. If you are interested in Thistles, joining the fleet has many advantages; it gives you great contacts with other Portland Thistlers who are a valuable source of information for working on your boat, purchasing a boat, many social events, local fleet racing on the Willamette, racing clinics by fleet members, local Thistle regattas, and an easy way to get involved on the NW travelling regatta circut with your own boat or as a crew. Joining the Thistle fleet is a great way to get involved in the sport with a great bunch of people. If you are not sure whether a Thistle is the right boat for you, we encourage and invite you to contact one of us for a ride or drop by WSC on race nights and introduce yourself. If you have a Thistle but are not sure whether to join the fleet, we invite you to attend some of our fleet meetings (more of a social event than a meeting), drop by WSC for local races, or attend a regional regatta.